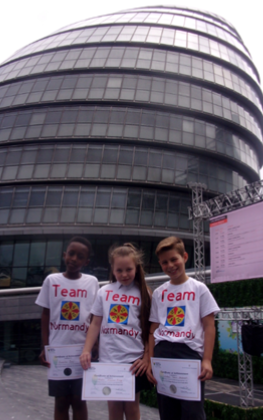 On Thursday 7th June, three of our Year 5 pupils competed in The Mayor's Fund for London 24 Games Semi-Final, which took place at City Hall in London Bridge. Ramadan B, Maddie A-R and Anduen T-M took on the challenge and scored 296 points. Anduen was proud of the team spirit after a difficult start. He commented 'Winners never quit and quitters never win'. Maddie added, 'I loved the whole day, my favourite event though was code breaking - we scored full marks!' Ramadan stated, 'There was a lot of pressure on our shoulders as we were representing Normandy, but I think we did the school proud'. Mr McDonald, Miss Martin and Mrs Whittington are extremely proud of the children and we look forward to seeing how far they go in the competition. Well done 'Maths 24' team!